The appeal circulating across Japan is for everyone to turn out the lights June 22nd, and light candles. The occasion is the Candle Night Summer Solstice 2007, a pitch for energy conservation tied to the summer solstice, the point at which the sun is at its farthest point north of the equator. The campaign began in Japan four years ago, with a million people flicking off the light switches and lighting candles as a symbolic gesture against global warming. Last year, more than five million people participated in the evening lights-out crusade. “It’s easy to save energy,” says Isamu Jahana, one of the organizers. Curbing carbon dioxide emissions is an integral part of reducing global warming possibilities, and it focuses on little things. ”If every Japanese household switched to energy saving light bulbs,” says Jahana, “it would save as much in fuel costs as it does to power 920,000 automobiles.” The Candle Night Summer Solstice project is comprised of numerous local organizations interconnected as a national campaign. On Okinawa, NGO Make The Heaven team headed by Rep. Hiromitsu Kibo and Wind Firm Rep. Ryuuichi Nakamura are touting the affect individuals can have. In Tokyo, a coffee shop chain began having a candle light night once a month, encouraging patrons to think about the environment. 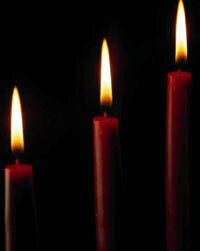 Now, the candle light nights have expanded to nightly, with Eco-Nights bringing increased sales. The organizers are looking for volunteers. Jahana can be reached at isam@suiren.cc or by calling 090-1944-9950.